While the electric guitar got its start in the blues genre of music it was the rock genre that give its real popularity. It was with rock music that the electric guitar became a hugely expressive instrument that added a whole new element to the genre. Many guitar lessons will touch on the rock genre and give you the basics but if you want to really learn to play rock guitar there are some certain aspects you will want to take up and focus on. Focusing exclusively on rock music is important if you want to really get good at it. Many of the things you will cover when you learn to play rock guitar can be spread across these three areas: learning the basics about playing the guitar itself, lead guitar and finally, power chords. These kinds of lessons are typically for the true beginners. If you’re already knowledgeable about the guitar you can skip some of these. You’ll want to talk to your teacher to find out what can be skipped and what skill level you’re actually practicing at. If you’re a true beginner like many people are you will start off just holding the guitar. You will cover the basics of playing the guitar in general and then move on to playing rock guitar specifically. Most lessons will cover the basics about rock lead guitar and power chords to give you a fundamental basis to work forward from. Once these first lessons are done you will have some ideas on how to play classic rock guitar and if you get these down you will be well on your way to playing rock guitar at the skill level you aspire to. The following guitar lessons will probably cover various rock techniques like sliding, string-bending, pull-offs, vibrato and hammer-ons. 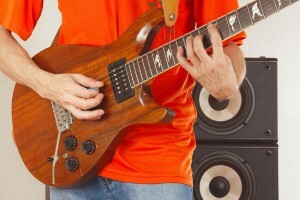 The tips will enable you to play some pretty good rock solos. Most lessons will help you learn about scales and chords that will assist you in creating and writing your own music (the end goal for many). While there may be a good deal of blues references within these beginner lessons, covering these will get you to understand the relationship between blues and rock. This is essential if you really want to learn to play rock guitar like a professional someday. What are power chords? Power chords are two or three string distorted sounding chords that are often used in popular rock songs. You will likely learn to play several popular rock songs during the first few lessons of a teaching module. Once completed you will be very familiar with the instrument as a whole, including the fret board and you’ll likely amaze yourself with the sounds you’re able to produce with the guitar. If you genuinely want to learn to play rock guitar then don’t get frustrated or discouraged if you don’t progress the way you want to. If you enjoy the process and playing the instrument then eventually the progress you want will manifest itself. Finding a good guitar teacher you can communicate with is half the battle. After that you simply need to design a workable schedule to practice and, even more importantly, have a good time while learning the instrument.